IQS Directory provides a detailed list of stainless steel fastener manufacturers and suppliers. Find stainless steel fastener companies that can design, engineer, and manufacture stainless steel fasteners to your specifications. Peruse our website to review and discover top stainless steel fastener manufacturers with roll over ads and complete product descriptions. Connect with the stainless steel fastener companies through our hassle-free and efficient request for quote form. You are provided company profiles, website links, locations, phone numbers, product videos, and product information. Read reviews and stay informed with product new articles. Whether you are looking for manufacturers of stainless fasteners, metal fasteners, and steel fasteners of every type, IQS is the premier source for you. Ford has been manufacturing and selling quality stainless steel fasteners for 46 years. Ford’s commitment to quality and service is its #1 priority and Ford’s experienced and talented workforce takes pride knowing that Ford’s parts are regarded as some of the best in the industry. Ford has a vast quantity of products for immediate delivery. Please call today for further information. Fasteners made of stainless steel are high-strength, corrosion-resistant tools used to fasten objects together. 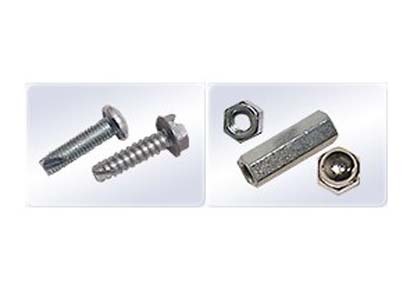 Stainless steel screws, bolts, nuts and other fasteners are very popular fastening tools because of their qualities of strength and corrosion resistance. Stainless steel fasteners are particularly popular in the automotive industry, which involves stainless steel screws in the construction of structural automotive components. Because automobiles are subject to variable weather conditions and hazardous contaminants like salt in some cases, stainless steel is an excellent fastener composition; it resists weather and salt-induced oxidation. 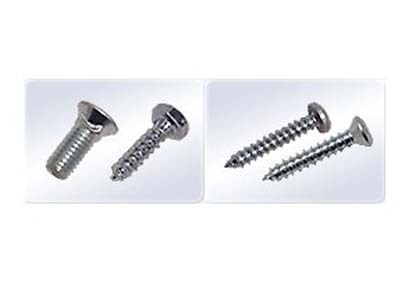 For these and other reasons, stainless steel screws are also used in the electronics manufacturing, medical products, watercraft building and construction industries. Stainless steel alloys are iron-based metals containing at least 10% chromium and other metals, which provide added corrosion and heat resistance. They do not require a protective coating, and they are able to perform well in a wide range of conditions and temperatures. Stainless steel fastener materials are identified as the B8 class of stainless steel alloys. These fasteners come in a wide range of head styles, shoulder forms, thread forms and point styles. Stainless steel fasteners are manufactured by two different processes: machining and cold heading. Machining is the preferred method for larger fasteners in smaller production runs. This procedure is older and creates a weaker product with less fatigue resistance. Cold heading forms stainless steel wire into different shapes by forcing it through die and punch cavities. This method is fast and takes fewer steps in the process. After the fasteners have been machined or cold worked, they are threaded if necessary. This is done by cold forming as well. Stainless steel fasteners are often precipitation-hardened, a form of aging that combines low temperature aging treatments and cold working. Stainless steel is not without its limitations, and it can be inappropriate for use in some contexts. Aerospace fasteners, for example, are often made of titanium instead of steel. Titanium is lighter than steel, which contributes to flight performance, and it is stronger, which is especially important in aircraft construction. That said, stainless steel performs very well when installed in automobiles and other vehicles. It is important to carefully pair fasteners with their applications. Especially in the context of automotive manufacturing, improperly chosen or installed screws can end up causing damage to the vehicle and injury to its user. Properly chosen stainless steel fasteners will contribute to the extended lifespan of the products and systems in which they are installed. Stainless Steel Fasteners - KD Fasteners, Inc. Fasteners such as screws, nuts and bolts, rivets, and anchors are the very common components for building and construction of machines and equipment. In basic terms, fasteners hold parts together securely. The history of the use of fasteners dates back to 400 BC. If you are planning to put together a project, you need fasteners. The ideal choice in such a scenario is using stainless steel fasteners, which provide several great benefits. Below, we will discuss some of those advantages that make it a clear-cut winner in holding stuff together. Resistance to corrosion: Stainless steel is not only ‘stainless’ but also a great fighter against corrosion. The coating prevents rusting, blackening, and tarnishing, making them long-lasting, durable. Moreover, they can tolerate a wide variety of environments; they perform equally well in extremely high heat as well as extremely cold temperatures. This flexibility makes these fasteners the component of choice for nearly every application. High ductility and strength: Stainless steel is a strong element. Thus, so are stainless steel fasteners. Since stainless steel is an alloy, it is more robust than normal steel, which gives it higher tensile strength and durability. They can also be designed to take tension loads, and are immune to effects of fatigue due to cyclic loading. Life cycle costing: This is an important economic analysis involving both pending and future cost of a component to understand the true cost of a project. Since stainless steel offers tremendous durability, there is hardly any pricey remedial or refurbishment needs, making it low on life cycle costing. With the advancement in alloy technology, their service life will continue to increase, which will make them even more cost-effective in the long run. Cent percent recyclable: This is an environment-friendly product, as stainless steel is 100 percent recyclable. When they reach the end of their service life, you can recycle them and recover the valuable alloying elements such as chromium, nickel, and molybdenum. They allow significant energy savings and reduced CO2 emissions in production process that use recycled materials. Reasonably cheap: Stainless steel fasteners are the most commonly used fasteners thanks to mass production methods, relatively simple manufacturing processes, and lower input costs. They are a bit more expensive compared with other fastening mechanisms; however, in the long-term, they far outweigh the original cost as they last longer than their counterparts. Easy installation and disassembly: Stainless steel fasteners can be installed and uninstalled quickly. Especially, fasteners like nuts and bolts, and screws are easy to install; a few twists of the wrench or a few rotations of the screwdriver, and you are done. They look good: Stainless steel is, characteristically, shiny and beautiful. They do not get scratches easily and they can be made to different brush finishes, making them suitable for application where held parts are visible from the outside or where the screws or bolts are a part of its visual persona. Also, due to these characteristics, they are low on maintenance and are easy to clean. Stainless steel fasteners are a widely available, robust, economical, and environmentally-friendly option when it comes to fastening components.